You can target an unlimited number of Android devices in your PSD, then copy your design to various target screens after you approve your default device design. 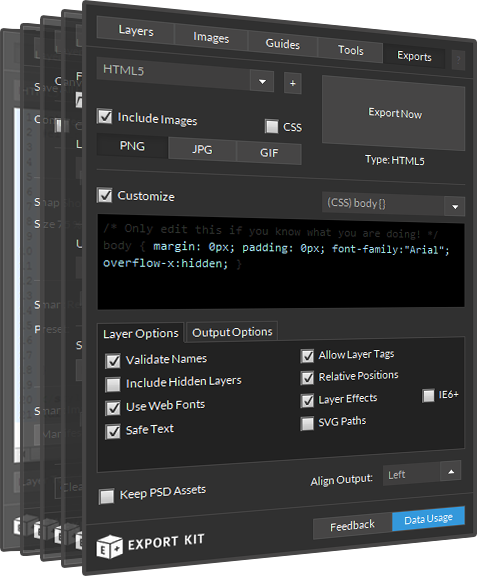 All assets and layouts are generated by Export Kit from your PSD to Android output. Each target screen will generate an individual layout and drawable folder for the screen assets, but only one Java Activity is created per Android layout. IMPORTANT: 800px in your PSD will target 2560 xhdpi – you must consider pixel to dpi conversion or download our Android PSD templates and start there. Use CSS Screen Tags to create unlimited target screens for Android devices. Read our tutorial on Converting a PSD to Responsive CSS which applies directly to Android also! This guide will show your custom Android XML UI targeting multiple devices from your PSD to Android XML export. You should have an idea of the screens you are targeting and their DPI settings before you create your PSD design for multiple Android screens. 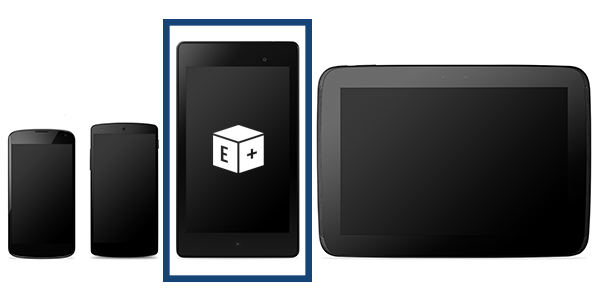 Each device you target should have a CSS Screen reflective of the device size. 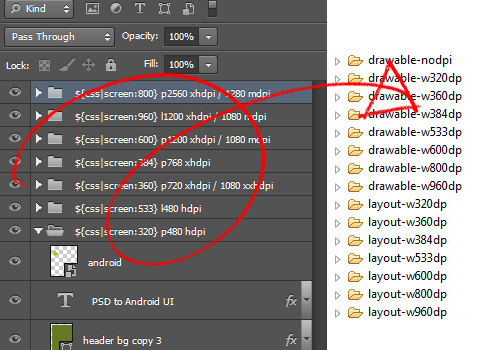 All assets and elements placed in the CSS Screen folder will resize to match the Android layout in the output. NOTE: If you are targeting 4 devices, you may have up to 4 target screens. IMPORTANT: Because Android use DPI and Adobe uses Pixels, some text elements may need to resize - learn more. 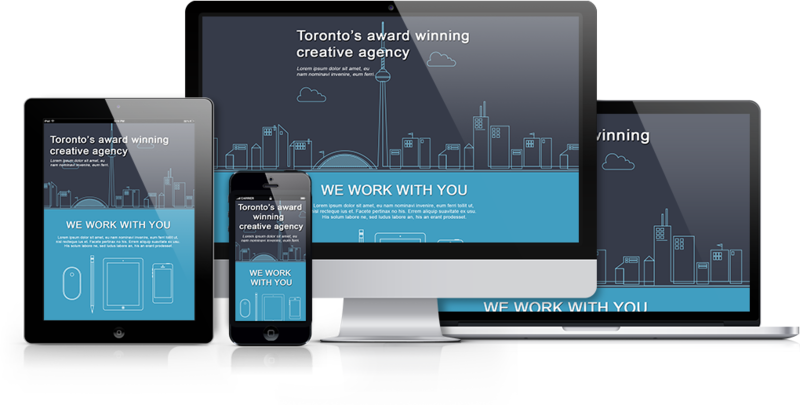 Read more about Responsive Screen Sizes. a) Restrict the user to a single Orientation, the user cannot "flip the screen"
b) Create an additional CSS Screen to support "flip the screen"
Your project requirements will determine if you need the user to have a single or multiple orientation view, but Export Kit makes that process simple and easy! NOTE: If you are targeting 4 devices +orientation, you may have up to 8 target screens. Android supports an unlimited number of devices along with custom devices which load the Android platform, eg. Touch Screen Kiosks. You will need to manually draw a rectangle shape to match the layout width of your Android screen. This may take some trial and error, once you have a pixel size the matches your Android screen width, create a CSS Screen to match that size. IMPORTANT: Because Android use DPI and Adobe uses Pixels, you must draw custom screen sizes to find the pixel size related to your Android screen - learn more. Images will auto-resize to the correct layout and drawable size, respective of your CSS Screen and target size. Some images may require a re-export to match the correct dpi (if not already set in your PSD). When you place your images inside your CSS Screen folders, you do not need to enable any furhter options or take additional steps – thats it, Export Kit does the rest! Learn how to Export Your Images with different DPI settings. If you are using Android Studio to generate your layout for your design on the fly, then expect to have blury images – this is common. 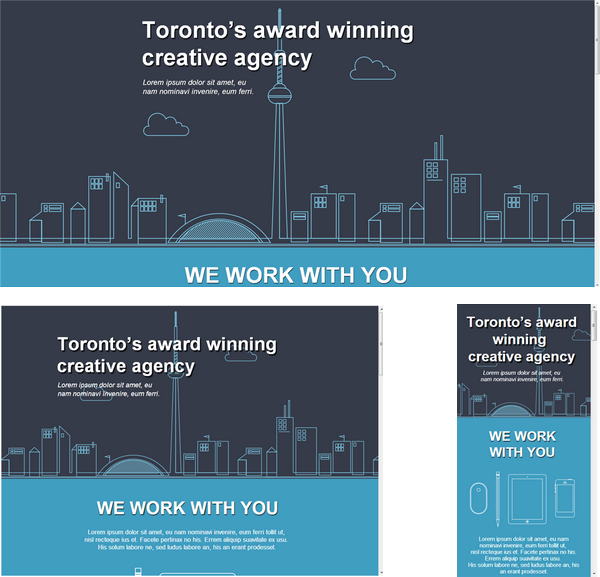 If you do not add target screens to your PSD design, Android will assume you medium-density assets only. NOTE: You will need control the Bitmap density with setDensity(), passing a constant from DisplayMetrics: DENSITY_HIGH or DENSITY_LOW. Read more about Multiple Screen Support on Android.com.